Lashes come in various shapes, sizes and not to mention colours. The standard colour is black but other colours from sedate brown, ideas for blonds, to wild red and cool violet. What Are The Lengths & Sizes Of The Lash Extensions? Lengths vary from 6mm up to 14mm but the average ranges are 10mm, 11mm and 12mm. 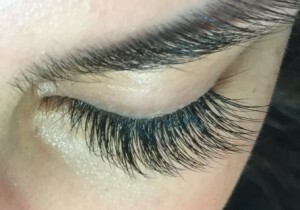 I tend to use 3 – 4 lengths on each eye to replicate natural lash growth, starting with the smallest length in the inner eye working outwards along the lash line. Lash thickness varies from 0.06, 0.07 (used for Russian Lashes) and 0.10, 0.12, 0.15 used for natural looking lashes and occasionally 0.20. Lashes also come in different shapes, the J curl is a more natural curl, B curl slightly curlier, the C curl tends to be the most popular for a more glamorous look and there is also a D curl for people who already have very curly lashes.